He arrived back from the farmers market with the usual suspects: greens for juicing, plenty of salad greens, plump berries of all kinds and a surprise! I thought, mmmm chocolate perhaps? He instructed me to close my eyes, which I did obediently. Then he said "Now smell this." Oh, I thought, not chocolate, brain switches to olfactory mode and I inhale with odor identification in mind. A floral, but not the usual farmers market flowers...a little powdery, a bit of green, a slight spice note and hmmm, is that a back note of soap. I am perplexed, I think...not rose, not jasmine. I finally give up. It was a bouquet of beautiful violet and white lilacs! 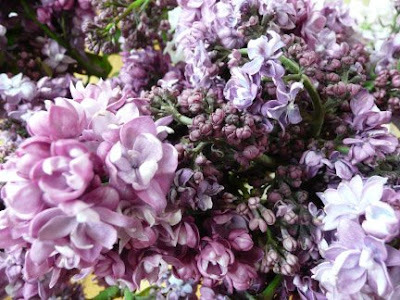 Lilac, as a raw material to the botanical perfumer is not currently available. They have tried many times to extract the lovely fragrance, but, to no avail. It is one of those rare beauties whose time has not yet come. Although, may arrive shortly. As I've continued to inhale the fragrance throughout the day, studying the array of notes permeating the dining room. I have come to the conclusion that there is a lilac component to the botanical perfume Vespertina. I have cracked open a few of the perfume books in my collection. Sure enough some of the natural components which create the fragrance of lilac are in Vespertina. Images ©Roxana Villa. 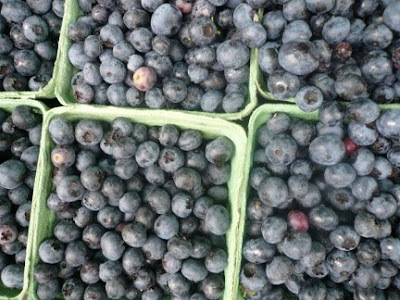 The blueberry photograph was taken at a farmers market in Vancouver last Summer and the Lilacs are the ones that Greg brought me today.